On December 18, 1884 neighbors of William Druse, near the village of Little Falls, in Herkimer County New York, found his door locked and windows covered with newspaper. There was no response when they knocked but they knew someone was home because a dense, black, foul smelling smoke was issuing from the chimney. Druse lived in the dingy yellow farmhouse with his wife Roxalana (known as Roxy), his 19-year-old daughter, Mary, his 10-year-old son George, and his 14-year-old nephew Frank Gates. William Druse, aged 60, was eighteen years older than his wife, and considered by neighbors to be lazy, ill-tempered and abusive. Their fear at first was that William had murdered his family and fled. Soon after, Mrs. Druse and the children were seen alive but Mr. Druse was missing When asked about her husband, she said he had gone to New York City. But the unusual circumstances, especially the offensive smoke, prompted neighbors to suspect that William Druse had been the victim of foul play. Rumors began to spread which led to an official inquiry and Herkimer district attorney A. 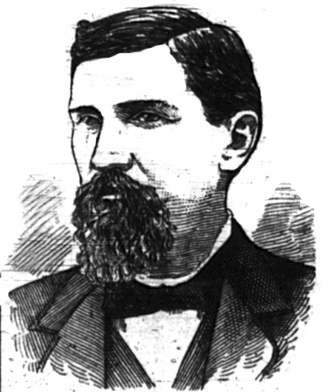 B. Steele arrested Druse’s nephew, Frank Gates. Under severe questioning Gates admitted the he had participated in the murder of William Druse and implicated the rest of the family as well. 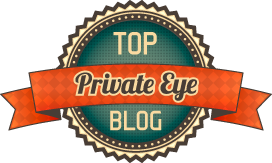 The next day Roxy Druse, Mary Druse and George Druse were arrested for murder. A second axe blow to the head killed William Druse. Roxy then used the axe to sever the head from the body and threw the head into the kitchen stove. Mrs. Druse sent Frank and George out to get a sharper axe. They returned with the axe then went into another room to play checkers while Mrs. Druse, using the axe, a razor, a jack knife, a board and a chopping block, dismembered the body and chopped it into little piece which she burned in the stove. She had Frank saw the bloodstained handle off of the axe and burned that as well. The next day, she and Frank took the ashes to Ball’s swamp about half a mile from the house. Using Frank Gates’s confession, the coroner was able to find the axe head and the charred remains in the swamp. Being late December, the remains were frozen together into a solid mass. It consisted of 18 to 20 small pieces of bone, one to two inches long, two knee caps, and the upper end of the left tibia. It was enough for the coroner to determine the remains were human. At the inquest, held on January 17, neighbors testified to the black smoke from the Druse’s chimney on December 18, and some testified that Mr. and Mrs. Druse frequently quarreled. Frank Gates told the same story as he had when arrested. Ten-year-old George Druse told a similar story of the murder but claimed his uncle Charley Gates, Frank’s father, was there as well and had handed his mother the revolver. Mrs. Druse was called to testify but said she did not wish to make any statements. After the inquest she declared that Charles Gates had been present when her husband died. She had also said this at the time of her arrest, claiming the Charles had fired several shots from his own revolver. She claimed they would find two different types of bullets in the body; however, any bullets in the body would have been destroyed by the fire. The coroner’s jury charged Roxalana Druse with murdering her husband by shooting and striking him with an axe. Mary Druse, George Druse, and Frank Gates were charged with giving comfort, aid and abet to Raxalana in committing felony and murder. They were taken to jail in the county seat of Herkimer in a close-covered sleigh. The trial of Roxalana Druse lasted two week and primarily consisted of the same testimony as at the inquest Some blood stained floorboards extracted from the house were entered as evidence. Mrs. Druse did not testify but her attorneys tried to claim that she had acted in self-defense, citing years of threats and abuse. In the end, the prosecution’s case, especially the testimony of Frank Gates, was too strong. Roxy Druse was found guilty of murder and sentenced to hang. 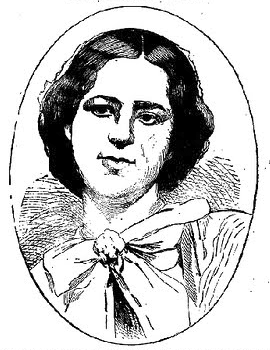 After a lengthy appeals process Roxalana Druse was sentenced to hang on February 28, 1887. The case aroused much public opinion both for and against her execution. One man offered to go to the gallows himself, in place of Mrs. Druse, another offered $10 if he could act as executioner. Souvenir hunters tried to get items of her clothing—shoes, buttons, hairpins, shoestrings. Women’s rights groups were strongly opposed to her hanging, saying an all-male jury did not constitute a jury of her peers. Also, since she did not have the right to vote, her status in society was the same as a minor’s and as such she should not be put to death. But in spite of many petitions for clemency, Governor Hill remained unmoved and would not change the sentence. On February 28, Mrs. Druse was hanged in Herkimer in front of twenty-five witnesses, though hundreds stood in the cold outside the prison. The hanging used the "modern" method where, rather than falling through a trapdoor, the condemned person is jerked upwards when a counterweight—in this case, 213 pounds— was dropped. Though she was jerked four feet into the air, her neck was not broken and it took her fifteen minutes to die of strangulation. 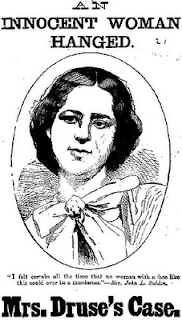 Roxalana Druse was the last woman hanged in New York State, and her botched execution was instrumental in replacing the gallows with the “more humane” electric chair. 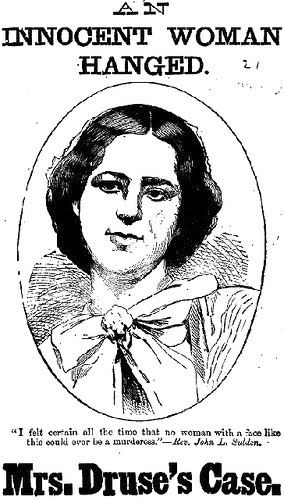 The day before her execution Roxalana Druse made a confession to her spiritual advisor, Dr. Powell, in which she declared that her brother-in-law Charles Gates instigated her to commit the murder and provided her with the revolver. She said the she had fired the first shot, but Gates fired the next three from the window and that Gates took the body and burned it. Mary Druse was sentenced to life in prison, but was pardoned after ten years. She claimed that her mother had never told the whole story. A book entitled An Innocent Woman Hanged was published some time after the hanging—author and publication date uncertain—which quotes Mary as blaming the entire murder on her uncle Charles Gates. Roxalana Druse, she said, had gone to the gallows innocent, to protect her brother-in-law. Tippetts, William Henry. 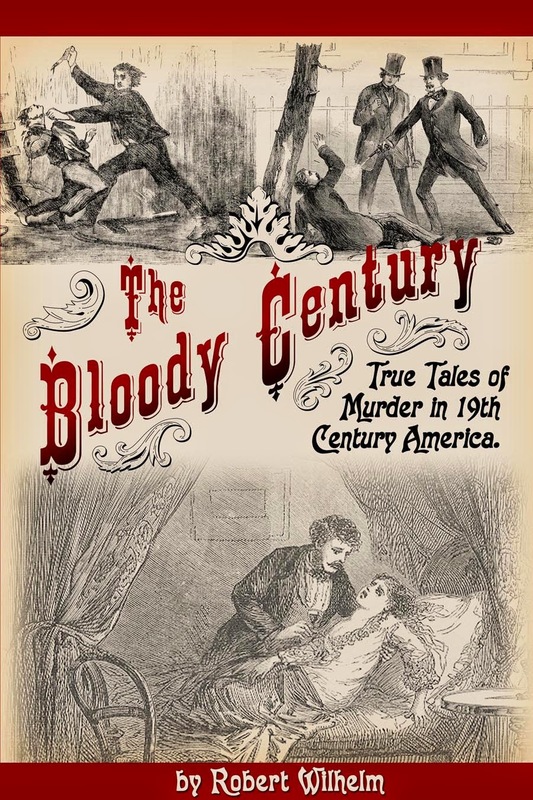 Herkimer County murders: This book contains an accurate account of the capital crimes committed in the County of Herkimer, from the year 1783 up to the ... Druse butchery, and the Middleville tragedy . Herkimer, N.Y.: H.P. Witherstine & Co., Steam Book and Job Printers, 1885. Mrs. Druse's case and Maggie Houghtaling An innocent woman hanged. The truth revealed at last. A startling confession. Dying innocent to save those she loved. Philadelphia: Old Franklin publishing house. Hill, David Bennett. Public Papers of David B. Hill, Governor. 1885- . Albany: The Argus company, printers, 1886. Dear Robert. I am working on a TV documentary and one of the stories we may be doing is Roxalana Druse. How would I be able to get in touch with you in regards to getting copyright for the pictures you have used?